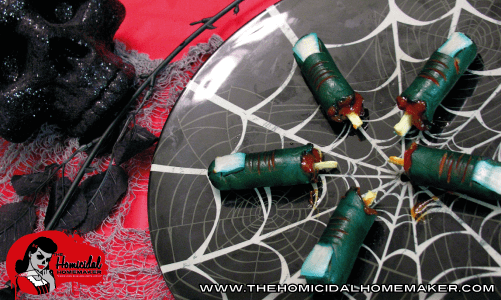 Thank you to all of my fans for making this post one of the top search results for zombie food ideas, zombie party food, zombie food and zombie recipes! 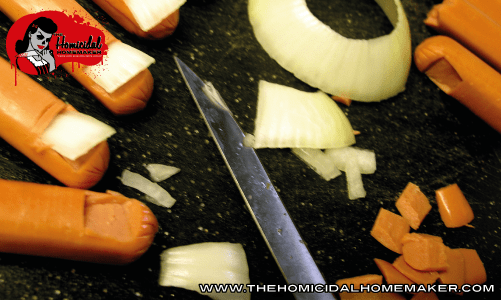 The Homicidal Homemaker shows you how to create the perfect zombie food for your next zombie party! 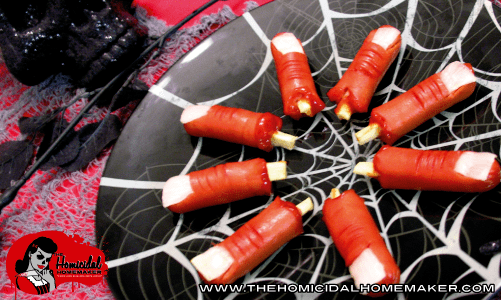 The Homicidal Homemaker’s gruesome Finger Food, two ways – Zombie Style, or Freshly Severed! Learn how to up the “gross out” factor of regular hot dog fingers. UPDATE: I’ve updated this recipe to make things even easier…and there is an amazing video for it, from my horror cooking show! Please check it out! 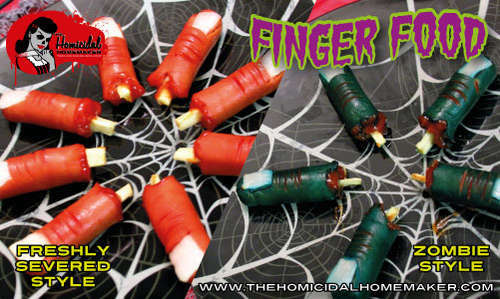 I’ve seen various ways to make edible ‘finger food’ all over the internet. I’ve seen people use cookie dough, bread sticks, string cheese, regular hotdogs, canned Vienna Sausages, and Lil Smokies, with variations for the fingernails, such as onions, bell pepper chunks and almonds, to name a few. I really loved the ideas I saw, but wanted to kick things up a notch, and enhance the gross-out factor and realism even further. By using chunks of fresh parsnips, fresh onion, and hotdogs with a few creative cuts, you can assemble these tricks and treats fairly quickly and easily! The addition of adding kitchen string and foil to two parts of the hotdog before baking adds slight contour and definition to the final piece. A few creative cuts where the knuckle would be make the hotdog slightly open while cooking, further adding to the gross-out factor! Awesome! I originally tried this method with only boiling, but the hotdogs didn’t ‘swell’ as much as I wanted them to, so I went to the next option – baking. This worked great! Not only did the hotdogs swell how I wanted, but the edges of the cuts browned slightly, and really made them look disgusting. Also, the onion was cooked perfectly (unlike boiling, where it quickly became soggy) and the parsnip was lightly baked and browned on the edge (while boiling, they softened too much and popped out!) which just looked plain disgusting, like a dried-out bone. 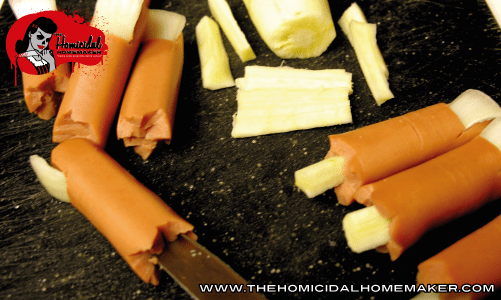 With parsnips, people either love them or hate them – a few of my taste testers simply removed the parsnip ‘bone’ before tasting, while others popped the entire ‘finger’ into their mouths with no hesitation. Heck, you could even leave out the parsnip altogether and still have a great appetizer! EDIT: I have now replaced the parsnip with mozzarella cheesesticks! If you are using vegetarian/vegan hotdogs, feel free to still use the parsnip. Step One: Start by ‘ripping’ the fingers. I did this by partially inserting the knife at an angle at the mid-point of the length of the hotdog, and rotating it while alternating my angles of the cuts. I didn’t want them smoothly sliced in half; this added texture makes them look extra ‘meaty’ and gross! 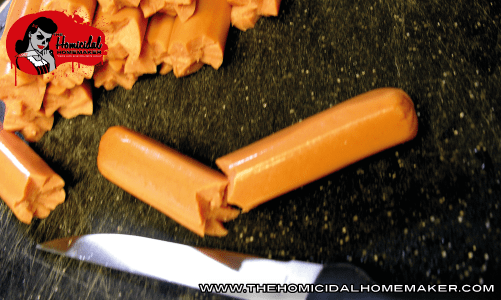 Step Two: Using your knife, cut out a small little flap of the hotdog, where the fingernail will be inserted. Cut a tiny slit at the base of the ‘nail bed’ where the wedge of onion will be inserted. This will help keep it in place better, as opposed to sticking it on. Place fingers in a pot of water, and bring to a boil. This ‘opens up’ the knuckles and plumps the fingers up. IMPORTANT! 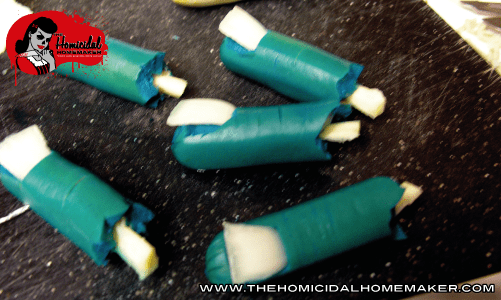 If you are making ‘zombie fingers’, generously color the water with blue or green food coloring at this stage. I used Electric Blue. After they have reached the desired shade, remove them from the water and pat dry. Step Three: Take your onion, and cut off a slice. Then take the slices, and begin cutting them into small rectangles, slightly longer than you want the fingernail. Then, trim the bottom of the rectangle to have a small point. Insert the onion into the little slit you cut at the base of the nail bed. 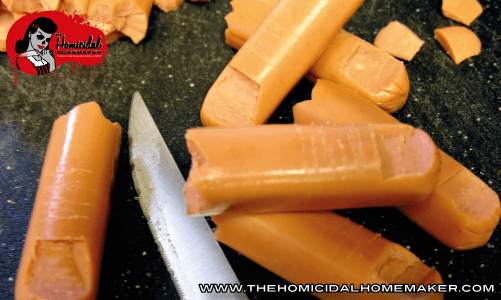 Using a drinking straw, remove a small ‘plug’ out of the ‘torn’ end of the hotdog, or, if you don’t have a drinking straw handy, use your knife to cut a small ‘X’. You want to go fairly deep, but not so much as to destroy or puncture the hotdog on the other end. Insert the parsnip into the hole or ‘X’ you just cut. Step Five: This next step is optional, but it does give some additional shape to the hotdog fingers. Cut your foil into 1-inch strips, and fold in half. 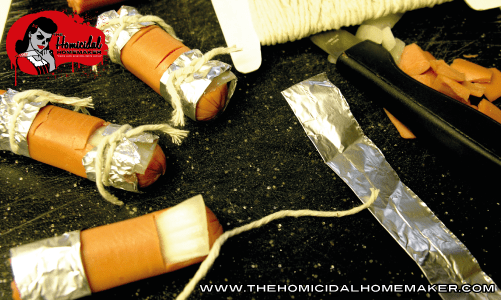 Then take the foil strips, and wrap them around the base of the hotdog (beneath the slits for the knuckle), and tie with kitchen string. Repeat, but this time above the slits, holding the onion in place. You want these firm, but not excessively tight. These will help add some shape to the hotdog during the next step. Step Six: Place your fingers on a baking sheet, and bake at 350 degrees for about 20 minutes. You will see the slits on the knuckle begin to open slightly and brown on the edges. The center part will also swell slightly. After about 20 minutes, check the onion and parsnip for crunchiness. If they still seem undercooked, place them back in the oven for 5 minutes increments until done. If you choose to skip the baking, simple saute the onions in a skillet until translucent, and lightly steam the parsnip pieces in a microwave safe dish. Step Seven: Let cool slightly, and then remove the foil strips and kitchen string. Arrange on a decorative platter or plate. 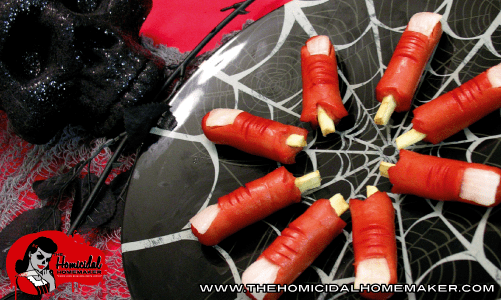 Then add some ketchup ‘blood’ to the ripped ends of the fingers! If you look at the photos, the addition of just a little bit of ketchup made a big difference! 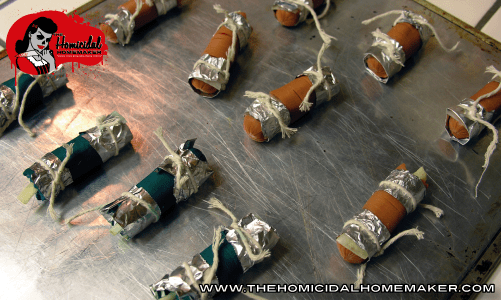 Previous articleEdible Entrails – A Morbid Twist on Pigs in a Blanket! You are truly the queen of Halloween! i really appreciate your content. im not big on horror but love halloween! I am going to bookmark your site and keep checking for new information. I loooooove your blog! Please keep posting more amazing things!